A Metabolism Boosting Smoothie, packed with ingredients that have been proven to have a positive effect on a healthy metabolism. Smoothies are often packed with sugar from using juices, too much fruit, or added sweeteners. 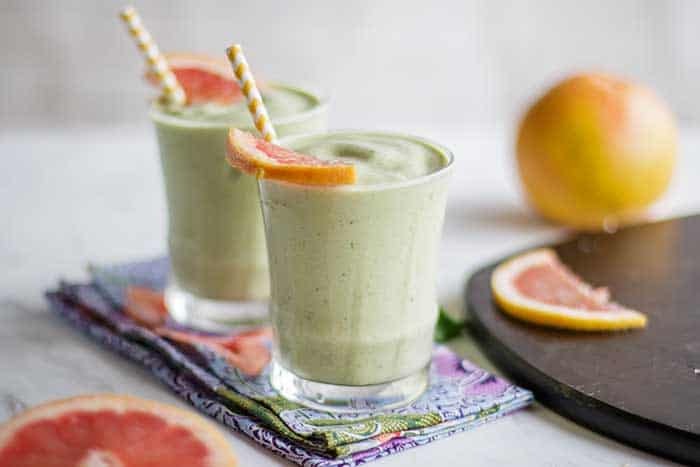 This grapefruit smoothie is a metabolism boosting breakfast idea, full of whole foods. This post was originally published in July of 2014. Because of it’s continued popularity, it was republished in 2018, with new images and updated recipe instructions. The recipe is still the original! Many of us need help with our metabolisms! Understanding how your metabolism works, and what things we can do to help our bodies to burn fat can help jump start weight loss. Some foods have a negative impact on our metabolisms. Processed foods, sugars, and hydrogenated oils, and foods with chemical residue (think produce that isn’t organic, or chicken treated with growth hormones), clog up our metabolisms. These foods do not have the nutrients our bodies need and crave, and slow metabolic function. Many whole foods have a positive impacts on metabolisms and can boost fat burning and weight loss. Staying properly hydrated also aids in a healthy metabolism. 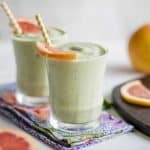 This smoothie combines foods that have been proven to have a positive impact on a healthy metabolism, into a creamy shake that is a great meal replacement or supplement to increase your fiber, protein, and water intake. Studies have shown eating grapefruit or drinking grapefruit juice, without any other dietary changes, results in weight loss. However, people who eat fresh grapefruit lose more weight than juice drinkers. 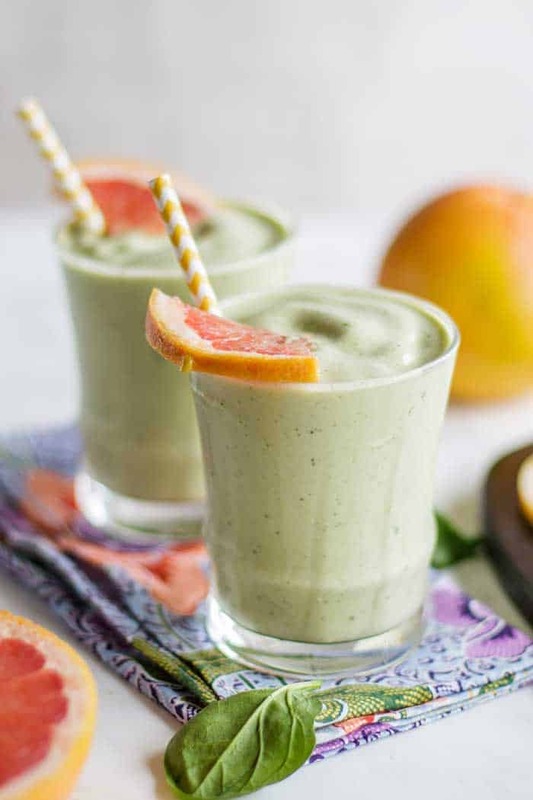 In this smoothie, the whole grapefruit is eaten, rather than just extracted juice. Pineapple is high in vitamin C, a compound important for a healthy metabolism. A vitamin C deficiency lowers your body’s ability to oxidize fat. This leads to fatigue, and retention of body fat. One cup of pineapple has 131% of the RDA of vitamin C! 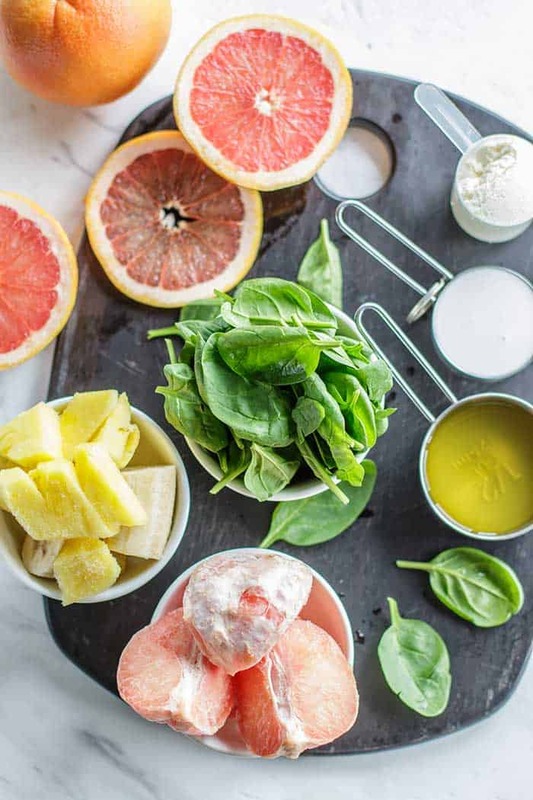 This metabolism booster smoothie recipe has over 200%. I freeze bananas for smoothies and to add to my yogurt while they are still green (they are less sweet this way, but once you get used to eating them, you’ll enjoy them this way too). The reason for this is green bananas are higher in resistant starch, and lower in simple sugars. Our bodies can’t break down resistant starches, but they help the body absorb vitamins and minerals (especially calcium, ladies! ), and inhibit the growth of disease-causing bacteria. Those are great benefits alone, but the other great benefit is that your body can only extract half the amount of calories from resistant starch than from other types of starches (this doesn’t mean your green banana has half the calories of a ripe one- because the whole banana isn’t made entirely of resistant starch or sugar). Lowering sugar intake is one of the best ways to lose weight. Anyone who has drank a smoothie with a scoop of whey protein powder knows the belly-filling effect of protein. However, the benefits of protein to weight loss go beyond satiety. Our bodies have a more difficult time holding on to calories from protein, meaning we burn more calories digesting it than calories from carbohydrates or fats. One high protein smoothie isn’t going to have a huge effect on weight loss, but studies show that increasing protein intake over long periods of time has a significant impact on weight loss. Studies suggest that a protein shake with about 160 calories, and 25 grams of protein, can increase metabolism by 25%! Green smoothies are a great way to start your day. There are lots of greens that can be added to smoothies, but spinach is a favorite of mine. 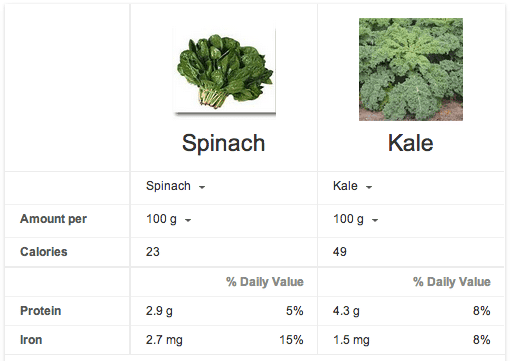 Spinach is actually more nutrient dense than kale. Calorie for calorie, spinach has 50% more protein, almost 350% more iron, and 30% more calcium (Kale does win the “nutrient battle” for Vitamin C!- so I wouldn’t say give up on kale just yet. It’s still super nutritious). All the time, we hear that green tea is good for our metabolism, but why exactly? Caffeine does have a positive effect on our metabolisms, but the powerful component of green tea is a compound called ECGCs. ECGS have a thermogenic effect that increase fat burn in the liver, and also inhibit lipase, an enzyme that absorbs fat in the digestive tract. In addition to all of that, green tea has been proven to increase satiety, making you feel less hungry. If you’re looking for a great green tea, I love Organic Sencha. I keep bananas, grapefruit, oranges, pineapple, and berries in my freezer at all times so I can always make a delicious smoothie. I also like to freeze greens like spinach, so I can always have them on hand. Remember to buy your bananas green and freeze them before they ripen for the lowest sugar content and highest resistant starch content. I love Biochem Natural Whey Protein Powder. It’s grass-fed whey, and it’s unflavored, meaning to artificial flavors or sweeteners. Keeping chemicals OUT of your diet is as important to your metabolism as what you keep IN your diet! Sub this whey with any vegan or paleo protein supplement if you have those dietary needs. Other ideas to boost the protein, if you’d prefer not to use a protein supplement, are hemp seeds and chia seeds. Both are great vegan sources of protein, are easily digested, and add protein and fiber, in addition to omega 3s. This combination of ingredients is sure to kick-start sleepy metabolisms. Packed with fiber, water, and protein, and tons of nutrients proven to aid with weight loss. It's a delicious combination that makes a healthy metabolism boosting breakfast! Add all ingredients to a blender, starting with liquids and greens, and adding frozen fruit, ice, and protein powder to the top. Blend until ultra creamy. Add extra green tea or water if you like a thinner smoothie. This recipe makes 2 smoothies, because I have found it is easier to blend 2 portions rather than just one in my blender. If you don't have someone to share it with, freeze half and drink it the next day. I find the texture is still great if I let it sit out for about an hour before I drink it, and stir well. Love this recipe for a Metabolism Boosting Smoothie? Share is on social media! Yes, green tea is great for so many aspects of our health. The metabolism boost is only part of it! Any downsides to substituting soy protein? This looks right up my alley, but I'm lactose sensitive. Do you know if it'd turn out the same? I can make it with whey protein for my husband and son though, they will love this! I can't see why substituting soy protein wouldn't work well! I'm allergic to soy, so can't say for sure. I'm also lactose intolerant, but whey isolate only has small traces of lactose, so I tolerate it well. Let me know if you try it with soy! Enjoy. Use Sun Warrior or Garden Of Life plant protein powder instead of whey protein powder if lactose intolerant. Yes, those would be good options-- but unfortunately, I have a life threatening allergy to peanuts and the legumes in the peanut family-- and most plant based proteins have green pea or soy or lentil protein, all of which are big no-nos for me! Whey isolate is over 99% lactose free, only traces, so I do fine with it. I have to try it! It is 3 a.m. here and I want to run to the supermarket to buy the fruits!lots of LOVE! Thanks Lindsay. I've really been enjoying them. 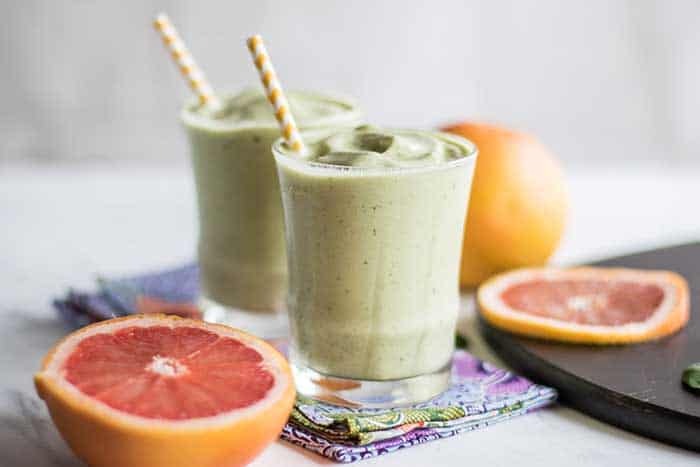 Grapefruit is a great smoothie ingredient, and really makes this one. The color of this smoothie alone makes me want to gulp it down!! I'm totally in love with green smoothies as well. I always think I should make one without green stuff in it so my smoothie photos look different, but I really don't like drinking smoothies without greens now! Can't wait to try this smoothie! I really like the mint green color of the ingredients! I Gawk at food gawker copy the recipe, and never bother to comment. Until this ! the ingredients are so simple, they seem like a strange combo but are perfect together. Amazing ! wow, healthy recipe. Nice pictures! This sounds so yummy, ok so what kind of green tea would you recommend getting, also what is 10g in cups as far as the whey protein goes. Do you recommend a certain type of whey protein powder. I am just getting started on changing how I eat so I'm new at the protein powder. I buy sencha green tea, but any high quality green or white tea should work fine. A shortcut I sometimes use is to use water, and a 1/4-1/2 teaspoon matcha powdered green tea.I post whey protein in terms of grams because different brands of whey come with different sized scoops. The brand I buy in the States- (http://amzn.to/1pbEYe8) BioChem Ultimate Natural Whey Protein -- has a 20 g scoop, so half of the scoop. I think it's about 1 1/2 tablespoons, but don't stress too much about the perfect amount! You can buy Biochem Whey at Fred's or Whole Foods, but it's cheapest ordered off Amazon.Mostly, I suggest buying a Whey Protein Isolate, as opposed to a concentrate, because the Isolate is just the protein, and the concentrate is only about 80% protein, with milk sugars as well. And also to buy a natural, unflavored Whey, to avoid artificial sweeteners.Enjoy! Thank you so much that really helps. I am so glad you enjoyed it! I have been hooked on them for several months now. I make two, freeze one, and then take one to work frozen the next day... only takes an hour or so to defrost so I can stir and drink-- and its still thick! Is there something I can use besides bananas? I actually am intolerant of bananas so I have to avoid them. I'm actually finding it hard to find healthy smoothies for weight loss that don't involve bananas or some sort of yogurt. That's because bananas make smoothies so delicious. Sorry to hear you can't have them!Mango is a great substitute for bananas. It adds the same sweetness and creaminess. I actually use mango, grapefruit, and green tea in smoothies all the time-- with a bit of protein powder. I really love this smoothie! I've been making it for years so am so glad you've reminded me about it! I have never made smoothie with green tea in it. What an interesting touch! It's a great way to add a few more antioxidants, and reduce sugar by swapping out juice! Thank you! My daughter was so excited for them! Awesome! It's a great smoothie recipe. I'd love to hear how you like them! I have lots of great smoothie recipes on the blog -- I recommend you also try my Chocolate Chip Mint Smoothies! Sounds so Delicious! This is going to be on my favorites list. I'll be adding a scoop of Complete soy (13g protein and 8gr fiber) plus half of an avocado. It makes the texture so creamy... Thank you for sharing! Those are great additions! I keep meaning to add avocado to my smoothies, but the truth is, I love them too much raw! Thanks for letting me know you love this smoothie as much as I do, Renee! Can I substitute the grapefruit for something else? It's too bitter for me maybe add some honey? If you really don't like grapefruit, use orange instead! It will work the same. Because this also has the banana and pineapple, I really don't think it needs sweetener. That was really interesting to realize about green bananas. I had never thought of it but it makes perfect sense. It doesn't make a big difference in calories, but any chance to get more resistant starch in your diet and lower sugar is a good thing!